Come hear a tale of an 18th-century pirate, a witch, and a spirit seeker. 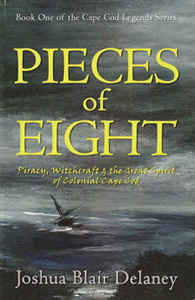 Joshua Blair Delaney's newly released work of historical fiction, Pieces of Eight, is set in the rich landscape of Colonial Cape Cod. His tale is of the people and events that surround the wreck of the pirate ship Whydah. An impoverished washashore named Sam Bellamy realizes that his only chance for prosperity is to turn to piracy. But his search for fortune will take him away from his sweetheart, Maria Hallett, whose moments of clairvoyance make the townsfolk wonder if she is a witch. Meanwhile, John Julian, a native man, follows the trail of the last wolf on Cape Cod. He is propelled by the belief that it is a messenger from the spirit world that will help him save the land he loves. Delaney's love of Cape Cod history shows in both his work and his presentation. Books will be available for sale and signing.